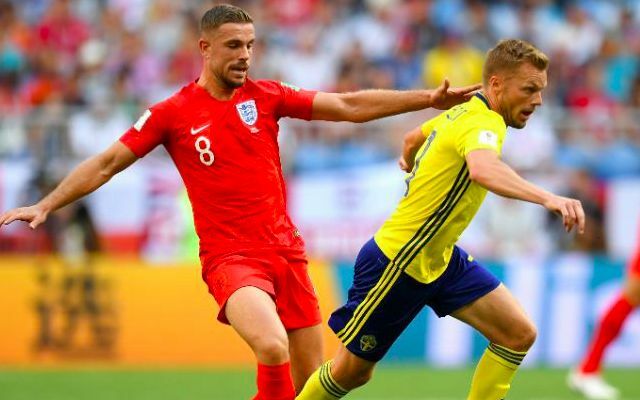 Rio Ferdinand insists Jordan Henderson proved himself as an attacking technician in England’s World Cup quarter-final triumph over Sweden. The Liverpool skipper continued a superb individual tournament to lay reliable foundations as the Three Lions reached their first semi-final since 1990. Besides thwarting Sweden in their bid to counterattack, Henderson proved equally integral to unlocking a defence that had rarely looked so unsettled throughout its time in Russia. Ferdinand has refused to let the Englishman’s all-action contributions go ignored, demanding the kind of praise a certain Andrea Pirlo would have earned for such a performance. Henderson was almost the root of an excellent England goal when he found the run of Raheem Sterling with an expertly-weighted first-time through ball, only for the Manchester City man to squander his chance. It marked one of many reminders of Henderson’s value in implementing Gareth Southgate’s defence-stretching attacking approach. The 28-year-old persisted in quashing Sweden’s attacking ambitions with a steely determination and a familiar effort to dictate the tempo of the game according to England’s preference. His defensive responsibilities also entailed a fabulous last-ditch block to deny Sweden on the rebound of a stunning Jordan Pickford save late in the second half. He crucially resisted early efforts from Sweden to draw England into losing their cool, evading any danger of a receiving a yellow card that would have ruled him out of the semi-final.